Want to celebrate the awesomeness you just saw visiting Niagara Falls? Cheers to beers! Or, whatever cocktail you’re into. 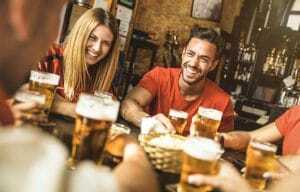 Grab your buddies or your beloved, and use this guide to plan one of the best Niagara Falls tours and things to do in Niagara: your very own Niagara Falls brewery and pub crawl. Try one of four house-brewed beers, like the Honeymoon Peach Radler, at this brewery, which also serves up food options. There are loads more beers on tap (ice wine beer is a must-try, but be warned – it’s at a 9.7 percent ABV), plus there are growlers for take-home brews. It’s about a 20-minute walk (or just a 4-minute drive!) to Margaritaville Niagara Falls, but walking is a great excuse to burn off some calories from the beer you drank, right? If your tummy is rumbling, you can fill up on island-inspired burgers and entrees here. Sip on margaritas or fruity cocktails that have that island vibe any time of year. The 1904 Lounge is only about a 5-minute walk away from Margaritaville. Named after the year its home venue, the Old Stone Inn, was created, 1904 is a cozy spot with handcrafted, generously poured cocktails. It’s a close walk to Myst Lounge from 1904 Lounge. Myst Lounge is located 33 floors high for prime views of Niagara Falls. Check out the diverse martini menu, with offerings like the Niagara Ice, made with vodka and ice wine. Pair your drink with something off the appetizer menu if you want, with items ranging from escargot to pork belly-topped polenta. It takes less than 10 minutes to ride to Doc Magilligan’s Restaurant & Irish Pub on public transportation or a ride-share, or you can burn off more drinks with a brisk 25-minute walk. It’s worth the trek, because this spot is decorated like a true Irish pub and features an extensive whiskey menu, in addition to classic cocktail favorites. Just a 10-minute walk away from Doc Magilligan’s is Syndicate Restaurant, a spot that’s just as much a destination for drinks and live music as it is food. Walk through a giant bookcase to get to the upstairs bar, which serves drinks like maple whiskey and red cream ale. Need a break from beer? Head right across the street from Syndicate Restaurant to Carpaccio Restaurant. Grab a glass of vino, or indulge in an adult coffee drink, like the A-52 made with Amarula Cream, Kahlua and Grand Marnier. Catch a quick 15-minute ride up north for more fun Niagara Falls bars to check out. Silversmith Brewing Company is a Niagara Falls brewery serving up around a dozen handmade beers, like the award-winning Black Lager. It’s worth another quick ride (10 minutes or less) to the Irish Harp, which boasts more than 20 different beers on tap every day. There’s also live music most nights of the week, as well as special events like Quiz Night if you want to battle the locals. From the Irish Harp, you’re only a couple-minutes’ walk away from the Exchange Brewery. You can tour and taste at the brewery on weekend afternoons, but if you come here at night, you can still sample of one about eight draft beers and a bevy of different bottled drinks. Check hours: Some places, even breweries, close around 9 or 10 p.m. at night. 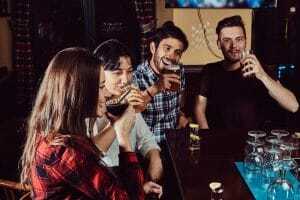 You might want to start your pub crawl around a 5 o’clock happy hour to get the most mileage out of your night. Uber and Lyft work in Niagara Falls: Never drink alcohol and drive. Always get a safe ride wherever you’re going. You can download ride-sharing apps like Uber and Lyft to get you were you need to go. There’s also public transportation you can take. Look up your smartphone’s map app to see what it recommends. Need a nightcap? Check out your hotel: There are many luxurious places to stay in Niagara Falls, Canada, and most have their own bars, too. End your night where you’re staying, and you can stumble back to your room just a few steps away. You should also fuel up so you don’t drink on an empty stomach and get sick. Find some tasty Niagara Falls restaurants (which also serve unique drinks), so you can balance out your night. Need help planning things to do in Niagara Falls? Contact us, and we can recommend some great pubs and breweries that are close to wherever you’re staying. Only Have 1 Day for a Niagara Falls Trip? No Problem!